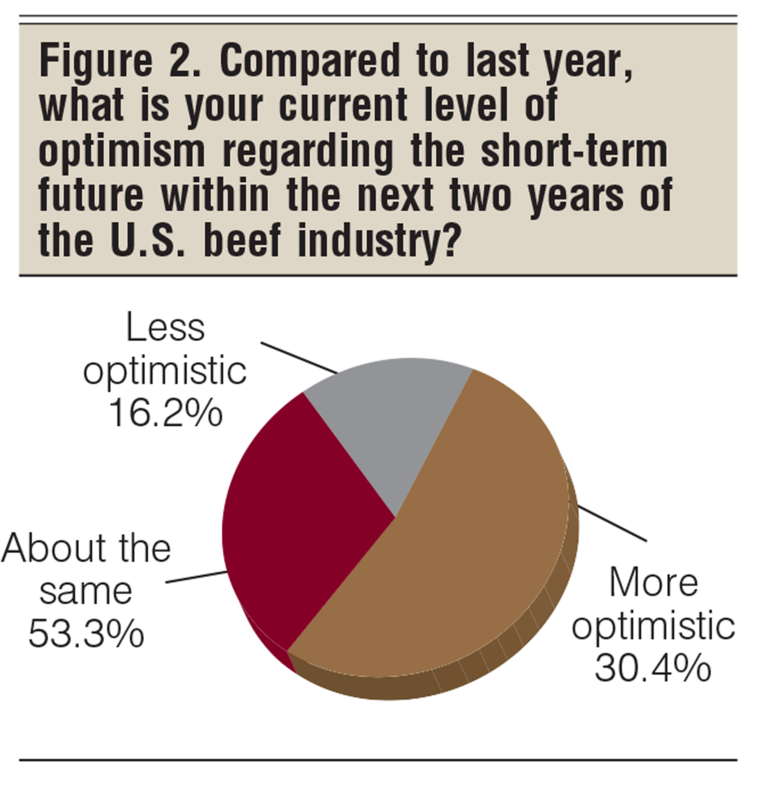 BEEF surveyed its readers for our annual State of the Industry report, and the results show that as a group, beef producers are looking ahead with confidence, in spite of a projected cyclical decline in cattle prices. 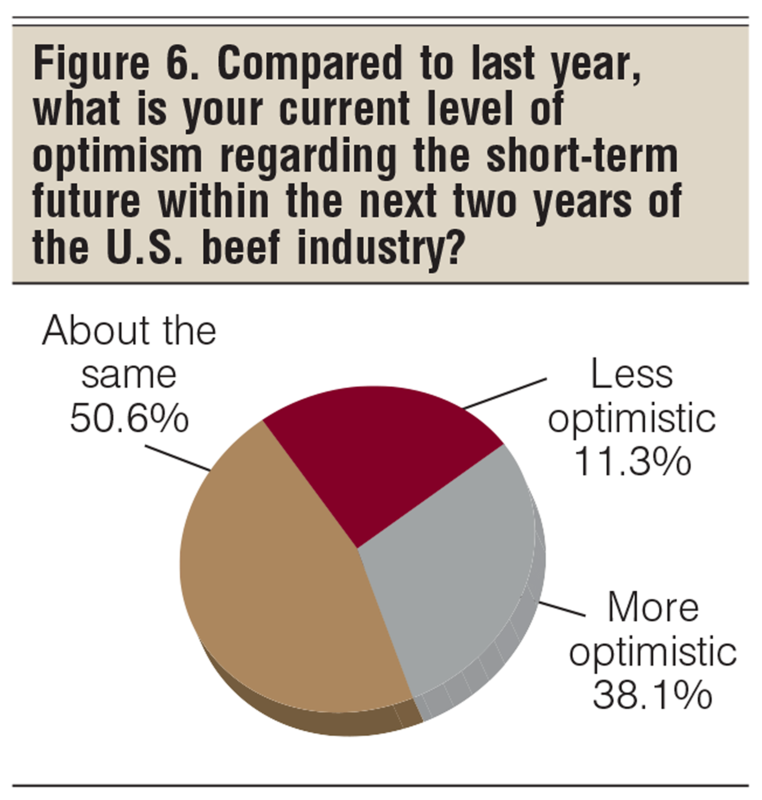 If there’s one trait that’s helpful, perhaps essential, for beef producers, it’s optimism. 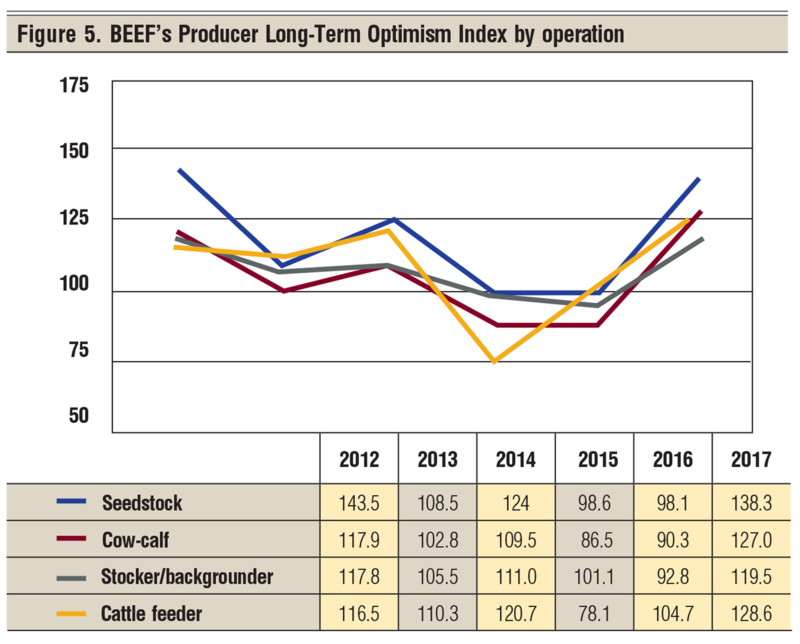 After showing a sharp drop last year, BEEF’s annual Producer Optimism Index shows a significant turnaround in attitudes in 2017. 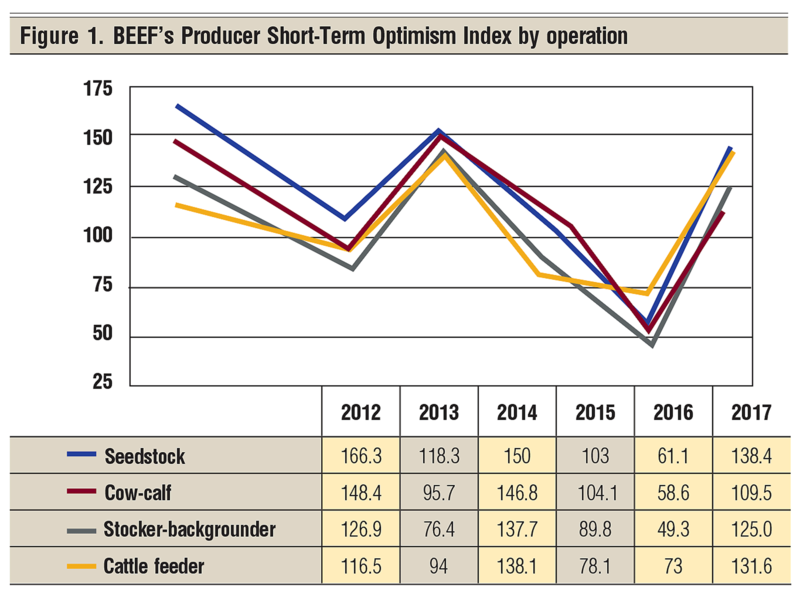 BEEF's Producer Short-Term Optimism Index showed a strong jump. While not at the levels seen in 2011, 2012 and 2014, short-term optimism is certainly on the uptick (Figure 1). When asked about their short-term optimism, within the next two years, 30.4% say they’re more optimistic, 53.3% are about the same and only 16.2% are less optimistic (Figure 2). The factors that are giving beef producers a more optimistic outlook are many, with 68.6% of readers listing international demand for beef as their top reason. 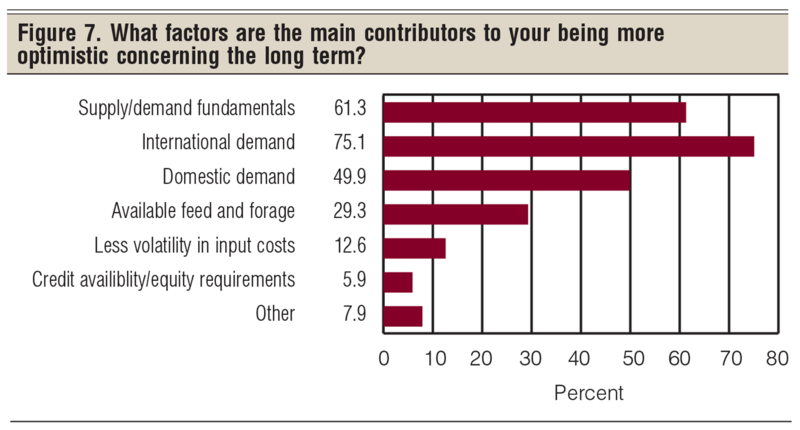 In addition, 50.2% say better supply-demand fundamentals influence their outlook, 45.8% see better feed and forage availability, and 41.5% are encouraged by rising domestic demand (Figure 3). Beyond that, many commented that changes in Washington, D.C., are strong reasons for more optimism. Totals equal more than 100% due to multiple answers. The 16.2% of respondents who are less optimistic for the short term list input costs as their greatest concern, with 62.8% checking that box. In addition, 45.9% are concerned about consumer demand, and 43.2% feel that government overregulation is a worry (Figure 4). Totals equal more than 100% due to multiple answers. And there are other reasons as well. Readers commented that cattle numbers and cattle prices are a concern, uncertainty over international trade is a worry, and some readers are concerned about how President Donald Trump’s decisions will impact their business. 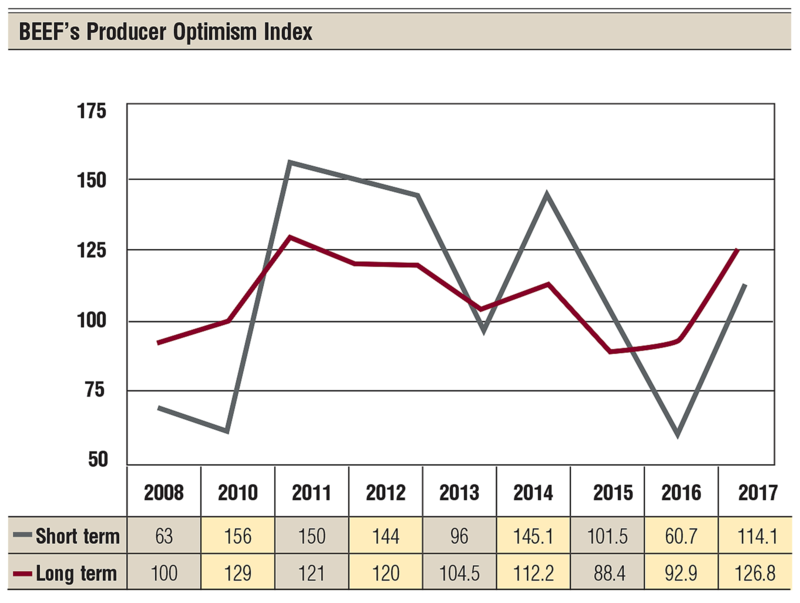 For the long term, five years and more, producer optimism is nearing the all-time high set in 2012 (Figure 5.) In fact, 38.1% of readers are more optimistic for the long term, while 50.6% have the same level of optimism and only 11.3% are less optimistic (Figure 6). The factors leading to a higher level of long-term optimism are similar to those lifting short-term optimism. The outlook for better international demand drew a 75.1% response, while the outlook for supply-demand fundamentals was notched by 61.3% and domestic demand was noted by 49.9% (Figure 7). Totals equal more than 100% due to multiple answers. For the 11.3% who are less optimistic about the long term, 54.9% worry about what input costs will do, while 48% are concerned about government regulations and oversight, 45.1% worry about consumer demand and 40.2% are concerned about industry consolidation and concentration (Figure 8). Totals equal more than 100% due to multiple answers. 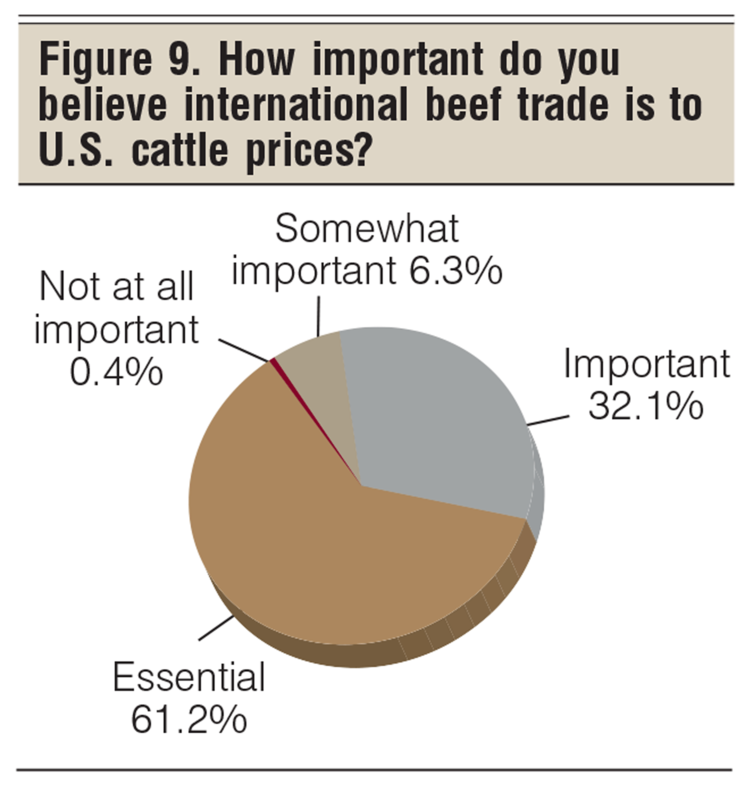 D rilling a little deeper into producer attitudes, we asked how important international beef trade is to U.S. cattle prices. The vast majority of respondents think it is, with 61.2% checking that it’s essential and 32.1% indicating that it’s important (Figure 9). Classic risk management, such as hedges, options and insurance, isn’t widely used by cow-calf producers, with 61.9% indicating they didn’t use any risk management tools last year (Figure 12). However, that seems to be changing, if only slightly. 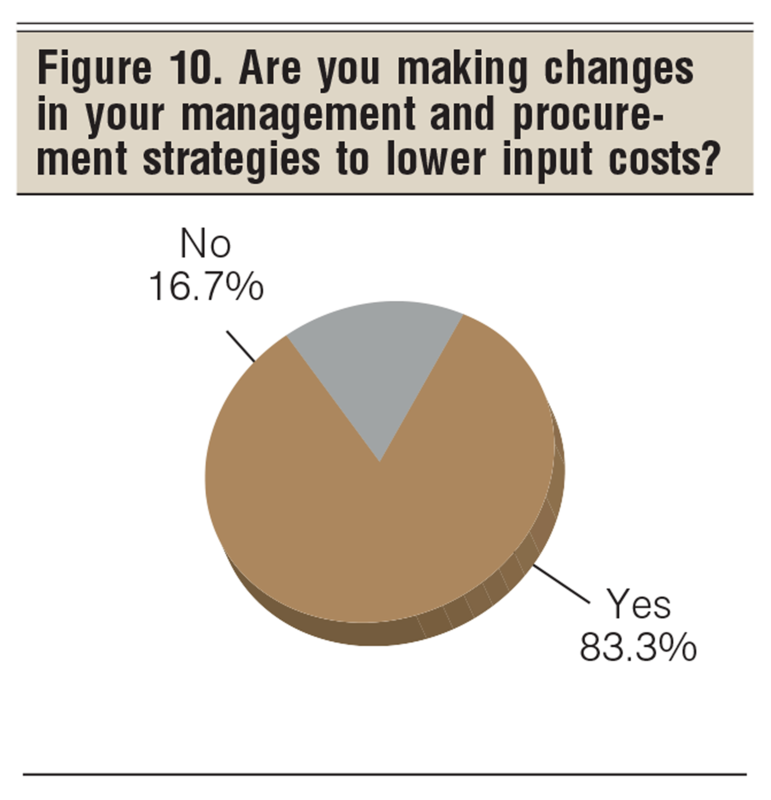 For 2017-18, 55% of respondents say they don’t plan to use risk management tools in their operation. That’s a 6.9% decrease over last year. The biggest change comes in the number of producers who plan to forward-contract their calves — 21% this year, versus 16.9% last year. In addition, Livestock Risk Protection appears to be more attractive, with 12.5% of readers considering it for this year versus 9.9% last year (figures 12 and 13). 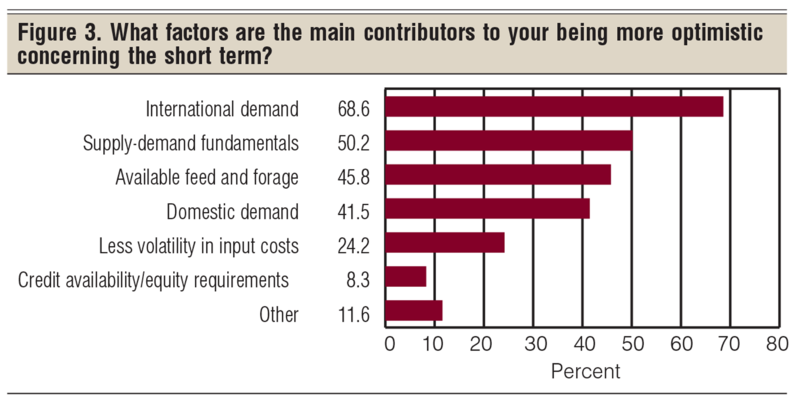 With industry attention focused on herd size and expansion, BEEF editors were curious what readers have in mind for changes in herd size. 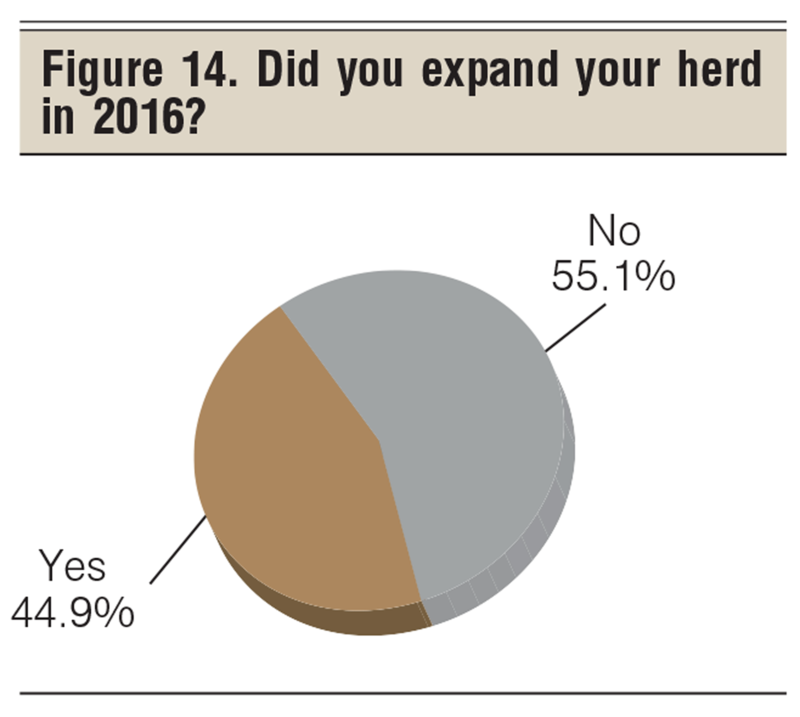 When asked, “Did you expand your herd in 2016?” 44.9% of readers indicated they did while 55.1% said no (Figure 14). And finally, we asked readers to share their bottom line. 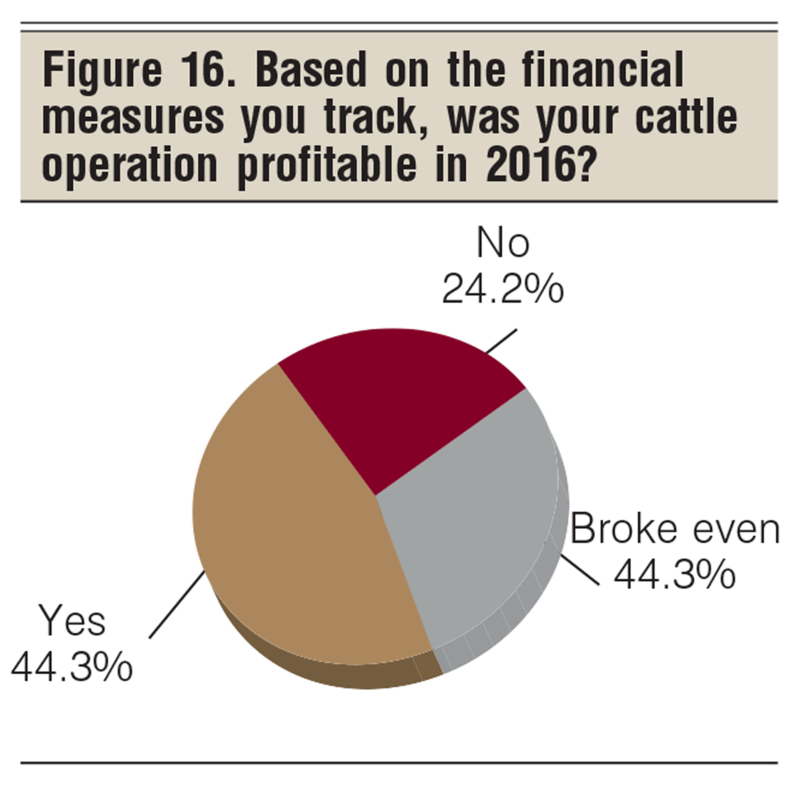 When we asked, “Based on the financial measures you track, was your cattle operation profitable in 2016?” 46.3% said yes, 29.5% broke even and 24.2% were in the red (Figure 16). We’re halfway through 2017, and the year is already shaping up to be different in many respects. Will the market highs we saw this spring carry over to this fall? Time will tell. But this year, as always, BEEF readers will adapt and adjust to what is thrown at them, striving always to keep their operations running as efficiently as possible.